Lashes have never been so feline! The arched millionizer brush stretches and defines each lash from root to tip. An ultraglossy black formula infused with the most precious oils lacquers lashes and creates ferocious volume for ultimate feline allure. 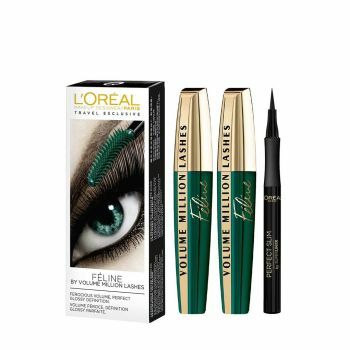 2 Volume Million Lashes Feline Black mascaras + 1 Superliner Perfect Slim Black.